By Allan Fox: #7 IBF Sean Monaghan has joined #3 IBF Bernard Hopkins, Isaac Chilemba, Erik Skoglund, Andrzej Fonfara in declining the International Boxing Federation’s offer to face unbeaten #2 IBF Artur Beterbiev (9-0, 9 KOs) in an IBF eliminator. The option now goes to #8 IBF Jean Pascal (30-3-1, 17 KOs), who has until August 21st to decide whether he wants to face the hard hitting Russian or not. If not, then the next contender in line to make the decision will be #9 IBF Sullivan Barrera (16-0, 11 KOs). The odds of Pascal accepting the IBF’s offer to face Beterbiev in an IBF eliminator match is slim and none. First off, Pascal doesn’t need to fight in an IBF eliminator in order to get a rematch with IBF/WBA/WBO light heavyweight champion Sergey Kovalev. Pascal will get a rematch with Kovalev sooner or later simply because Kovalev has almost no options for big fights in the 175lb division right now. He wants to fight WBC champion Adonis Stevenson, but he’s not getting much interest in return. Kovalev would like to fight WBA super middleweight champion Andre Ward once he moves up in weight to the 175lb division, but Ward is taking his sweet time in moving up in weight. It looks to some boxing fans like Ward is hanging around the 168lb division waiting to see if WBA middleweight champion Gennady Golokvin will move up in weight to fight him in 2016. I don’t see that happening, and Ward will likely wind up wasting time by waiting on that fight. Pascal is coming off of a poor performance in beating Yunieski Gonzalez by a close and controversial 10 round unanimous decision by the scores of 96-94, 96-94, and 96-94. The last thing that Pascal needs is to face someone arguably even tougher and more powerful than Gonzalez in Beterbiev. Pascal doesn’t need that fight and likely will reject the IBF’s offer straightaway and continue to look to get a rematch with Kovalev without having to fight for it. Pascal was recently stopped in the 8th round by Kovalev. Pascal had his moments, but he fell apart in the 8th round when Kovalev stepped up the pressure on him. If Sullivan Barrera turns down the fight against Beterbiev, then it’ll go to #10 IBF Edwin Rodriguez and then #11 IBF Thomas Williams Jr. It’s hard to imagine either of those fighters turning down the fight with Beterbiev, because it would speed up the process of getting a title fight against Kovalev greatly if theyh were able to beat Beterbiev, which would be a tough ask. Beterbiev is looking to become the IBF mandatory challenger for Kovalev instead of getting the title shot as a voluntary challenger. 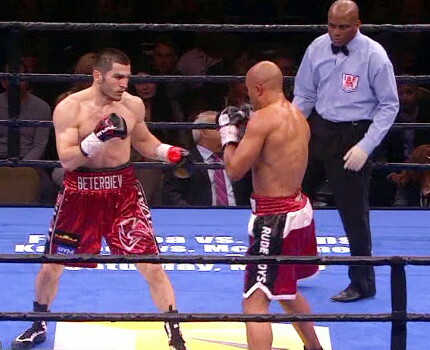 It’s a better deal for Beterbiev if he becomes the IBF mandatory. It just means Beterbiev has to work a little harder to get the shot by beating someone along the lines of Barrera, Pascal or Rodriguez.